Roaches are the No. 1 most despised insect in the home. Just one roach can send us into a frenzy, where we desperately reach for the insect spray in the hopes that we can eradicate that hideous creepy crawly that seems almost impossible to kill. 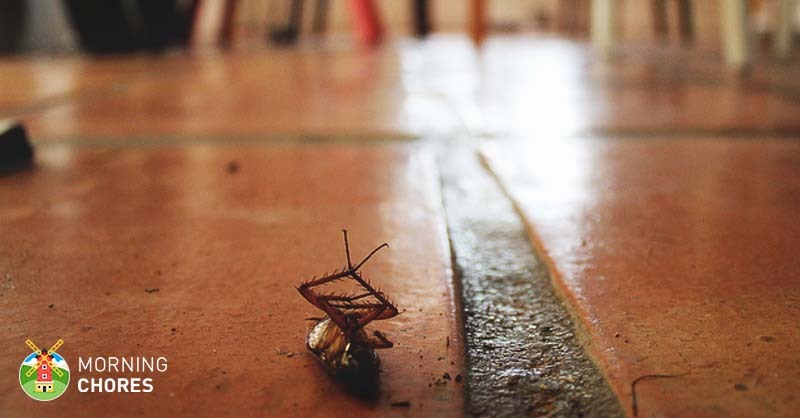 Although roaches are rumored to be tough enough to withstand a nuclear blast, there are some very powerful roach killer products that can help you eliminate and control roaches both inside and outside your home. Our top pick for the best roach spray is the Ortho Home Defense MAX Insect Killer Spray for Indoor and Home Perimeter. With a holistic approach to roach extermination, the Ortho spray bottle is easy to use and allows you to apply the spray anywhere around your home, inside and outside, so that you can protect your home from those evil looking roaches that are a health hazard as well. The high potent insecticide is very effective at killing roaches, even the most stubborn of cockroaches, the German cockroach. The Ortho spray is also a great choice if you want a more affordable way of controlling heavier roach infestations, and it gives you 12 months of protection, but you will need to re-apply it every 3 months. Controlling roaches has always been a very important part of household maintenance. Aside from their horrible appearance, their creepy rustling sound, and the fact that they can just materialize out of nowhere, and some species can even fly, roaches should be exterminated as they are a health hazard. They are carriers of bacteria and diseases, which they spread as they scuttle along the surfaces in our living spaces. 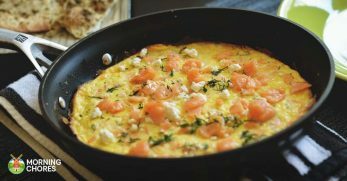 They can cause food poisoning and other health problems like allergies and asthma. Once they invade your home they can be very hard to eradicate, and just one cockroach can be a sign of a greater underlying problem, a large infestation. 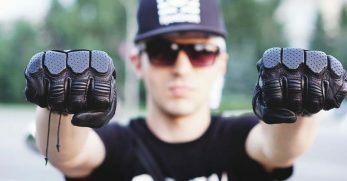 There a lot of different types of roaches, and some are very tough to eradicate, like the German cockroach, which requires a specific treatment to kill them. Other cockroach species that are very common are the American cockroach, the Oriental, and the brown-banded roach. One thing you need to keep in mind is the toxicity of the ingredients that are contained in roach killer products. 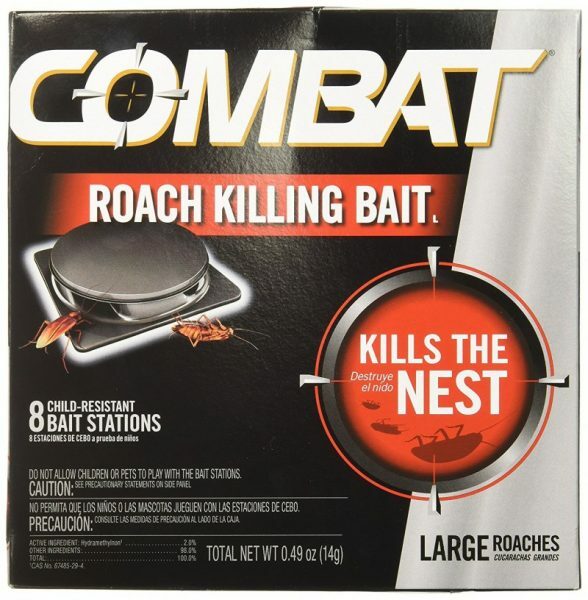 Most insect eradication products contain poisonous chemicals that can effectively kill roaches but can cause serious health problems if they are ingested by humans or pets, like Fipronil, which is contained in the Combat Bait stations. Fipronil is a very powerful insecticide but it can cause sweating, nausea, vomiting, headaches, stomach pain, dizziness, weakness, and seizures if it is ingested. 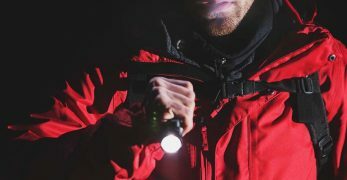 Other highly effective chemicals may target specific species of cockroaches like Imidacloprid, which is a very powerful chemical that is specifically designed to target German roaches, one of the toughest cockroaches to eliminate. 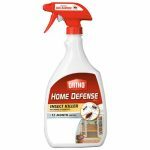 Imiprothrin and Cypermethrin are chemicals that are commonly used in insecticide sprays like Raid, and they are highly effective at killing pests that seek to invade your home. Although they have a low-odor and may have a pleasant smell that has been added by the manufacturer, some people may still find the spray irritating, and it may not be the ideal solution for people who suffer from asthma. Bifenthrin and Zeta-Cypermethrin are a powerful combination of chemicals that can kill roaches and other types of crawling insects. In particular, Bifenthrin is a broad spectrum pyrethroid insecticide, which comes from chrysanthemum flowers. This powerful chemical attacks an insect's nervous system once they eat it, which in turn causes paralysis and death. 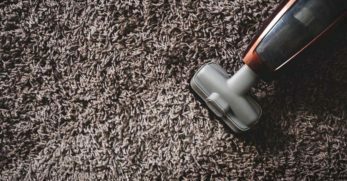 These chemicals are non-staining and odor free, and the spray is safe for children and pets to walk on once it has dried. MetaActiveTM is a high-performing compound that is used to target all species of cockroaches including German, American, Australian, Brown, Smoky-brown, Oriental, Brown-banded and Asian roaches. 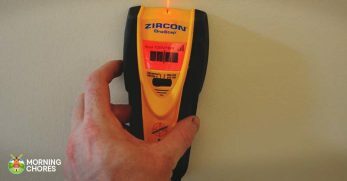 This type of chemical is used for industrial, commercial, and residential pest control purposes and it is highly effective due to its level of high-consumption by insects, especially for those cockroaches that develop a high aversion rate to insect baits. Whether you choose a fast acting poison or a slower acting powder that is low-toxic, any form of insecticide is hazardous to humans and animals. So one way to protect yourself and your family is to use the product in hard to access places like behind the fridge, under the sink, behind cabinets, or along skirting boards. 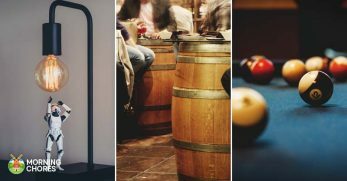 The hidden, dark places around your home are where roaches love to hide, so these are the best places to target them as well. When it comes to finding the right type of roach killer, you have a choice of one kind of treatment or a range of treatments to eliminate roaches. 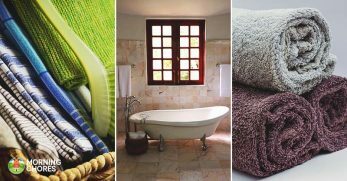 Some treatments are designed to target the occasional roach sighting, while others can be used for a larger infestation, and you can use them indoors and outdoors. 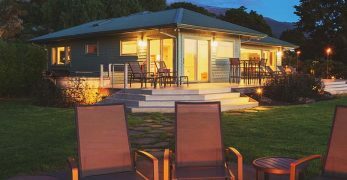 So before you pick up the phone to ring the local pest exterminator, there are some high-quality roach killers available that can help you to stay one step ahead of the dreaded cockroach. There are 4 types of roach killers, sprays, bait stations or traps, gels, and powders. Aerosol sprays are the most common types of roach killers. They are a very effective fast-acting knock-down approach to roach control, which allows you target specific cockroaches, especially the large cockroaches. Some types of sprays like Raid give you a longer term pest eradication solution as it can be used as a surface spray, so once you spray along surfaces like along the skirting board or behind the fridge, the spray's residual action can last up to 4 weeks, before you have to spray again. Bait stations or traps are the perfect way to kill roaches as they offer you a “no mess and no fuss” approach to roach control. The roach baits lure cockroaches through the chemical's irresistible smell and once they consume the bait, they die within a few days. Some traps like the deadly Roach Motel has a dual approach in their killing method. As well as luring them in to consume the poisonous bait, if any roaches try to escape, the trap is also designed to injure them and trap them on the strong adhesive inside the trap. Bait stations are not designed to kill the roaches instantly, but once the roach has ingested the poison, they carry it back to their nest and spread it to the rest of the roach population. Roach killer gels are the perfect choice for targeting insects in those hard-to-reach areas where roaches love to hide and they work very effectively at killing small amounts of roaches. You do not have to worry about touching the poison as it is safely housed in the tube and the handy applicator allows you to apply the gel in the cracks and crevices inside and outside your home. 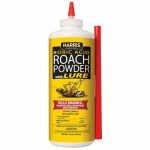 If you prefer a more non-toxic way of roach control, there are products that contain Boric acid powder, which is a chemical that naturally occurs in the soil. Once the roaches come in contact with the powder, it sticks to their bodies and legs and once they ingest the powder, it enters their nervous system and they will eventually die. This form of pest control works at a slower rate, and the roaches may still appear around your home, but the reason the powder is slow-acting is because it gives the roach time to unwittingly take the poison back to their nest and spread the poison to the entire population. 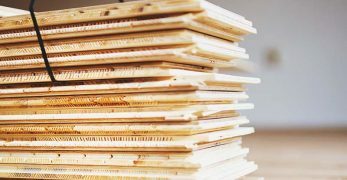 Although these kinds of roach killer products are very effective, there are a few thing you can do to eliminate roaches as well. Here are five tips for a holistic approach to roach extermination. One of the most important things to remember before you use any roach killer product is read the manufacturer instructions so that you use and apply the insecticide properly. Sometimes people do not see their desired result simply because they did not read the instructions. If you use powder, bait stations or gel, one way to get the best results is to place the baits or apply the gel where you have seen roach activity. Also, roaches are predominately drawn to areas where there is food or moisture like in the kitchen and the bathroom, so if you use a bait station, place the product behind the fridge, in the back or underneath cupboards or cabinets, behind the toilet, or near the trash can. 3. Keep surfaces clean and clear of food items. Roaches tend to scurry around our living spaces at night, so remember to wash up after dinner, and wipe down all surfaces, and take the trash out at night. 4. A handy tip for using a bait station or a trap. 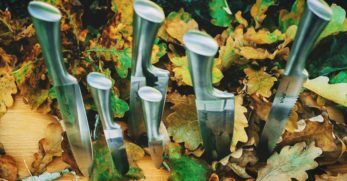 If you choose to use bait stations or traps, it is best to leave them in position for a week or so before checking them. 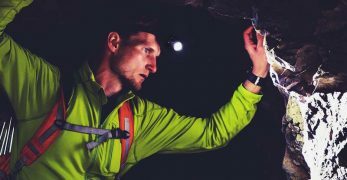 Roaches like to hide in quiet, dark places, and baits can take a while to kill their prey, so try to resist the compulsion to check the bait every day. 5. Choose the right roach killer for your home. 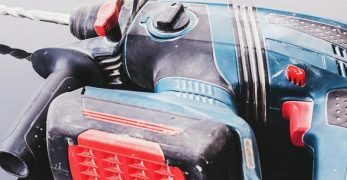 Eradicating roaches from your home can take a while, and you may need more than one type of product to kill the pesky insects. Sometimes it is a process of elimination to see which product works best for you. 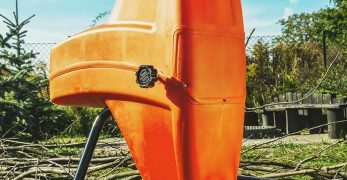 If you have a large home, a home defense system might be best, or if you have a small flat, you may benefit from using a gel or a few bait stations. 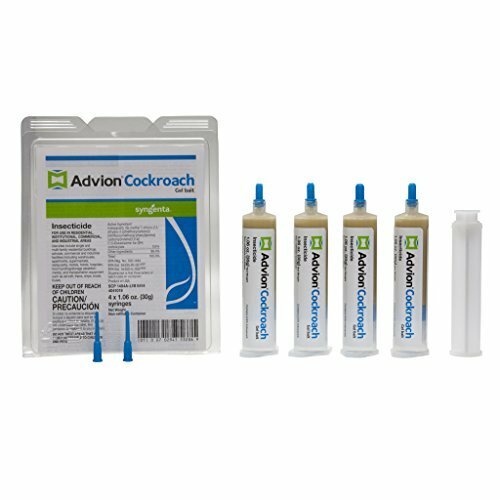 The Advion Syngeta Cockroach Gel Bait targets all types of cockroaches like the German, American, Australian, Smoky-Brown-banded, Brown, and the Asian cockroach, and allows you to target nasty creepy crawlies in the places where they love to hide, like in the cracks and crevices around your home. As the active ingredient in the high-consumption gel is the powerful MetaActiveTM compound that is used by many pest professionals, the Advion Cockroach Gel Bait can effectively kill from 7 to 10 roaches day and it is effective for up to 2 years. The gel is very easy to apply, and to get the best results, the manufacturer recommends that you use 3 to 5 spots of gel bait per 10 linear feet for heavy infestations, and 1 to 3 spots of gel bait per 10 linear feet for light to moderate infestations. The gel bait can be used indoors and outdoors, giving you all-around pest protection. The gel baits are also available in a single tube, or as a 2, 3, 5, 8, or 40-pack. 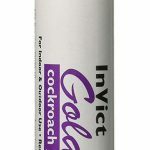 If your home is being invaded by those merciless German cockroaches, and you have given up on using other roach gels that have seemed to have lost their potency, then look no further that the Invict Gold Cockroach German Roach Control Gel Bait. This gel is highly effective at targeting and killing those persistent roaches that seem almost impervious to poisons, as it has been specially formulated to target the German Cockroach species. With this very effective and quick acting gel, you can give those German roaches their eviction orders. The U.S.A-based manufacturer, Invict Gold use the powerful chemical, Imidacloprid, as well as 11 other attractants to rapidly eliminate the roaches within just a few days of application. The product comes with a handy syringe that is extra long so it is easy to reach those places where German cockroaches love to hide, including cracks and crevices and under appliances. The tube contains 35 grams of Invict Gold Cockroach German Gel Bait, and it is recommended that you apply a pea size gel on several spots around the infested areas of your house. 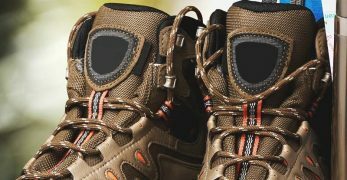 An all-around insecticide, the Invict Gold gel can be used indoor and outdoors. Invict Gold is available as a 4-pack. 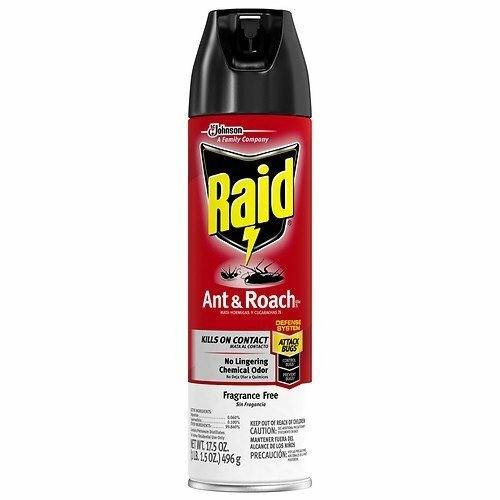 The Raid Ant and Roach Killer Spray gives you a “hands-on” approach to eliminating roaches with a powerful spray that kills them on contact and its residual action will keep on killing for up to 4 weeks! The active ingredient in the Raid spray contains Imiprothrin (0.060%) and Cypermethrin (0.100%), which are common insecticides that are well known for effectively killing pests that seek to invade your home. As well as being able to kill them on contact, the easy-to-use aerosol can also be sprayed directly along skirting boards behind furniture, cupboards, and fridges, all of those dark places where roaches love to hide. The Raid insecticide spray is also effective against other crawling insects like ants, waterbugs, silverfish, crickets, spiders, and the Multicoloured Asian Lady Beetle. The spray has a pleasant scent and it leaves no lingering chemical odor. 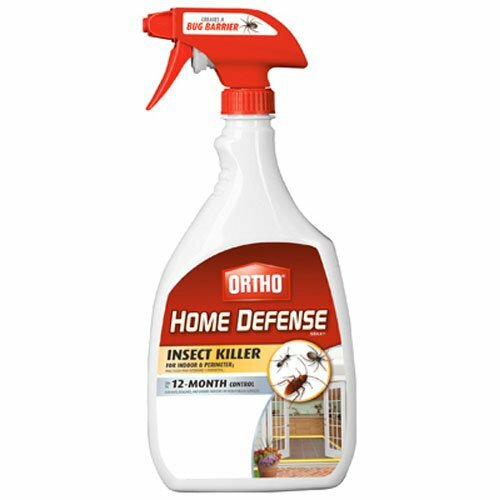 If you have a large roach infestation and you do not want to spend your hard earned cash on an expensive pest exterminator, then choose the Ortho Home Defense MAX Insect Spray. The 24-ounce compact spray bottle contains a fast-acting formula of Bifenthrin and Zeta-Cypermethrin, which is a powerful combination of chemicals that can kill roaches and it is non-staining and odor free, plus the spray is safe for children and pets to walk on once it has dried. As well as being highly effective at killing roaches, even those stubborn German cockroaches, inside your home, Ortho can be sprayed around the perimeter of your property and can kill 130+ other insects including stink bugs, beetles, earwigs, fleas, house centipedes, millipedes, scorpions, silverfish, and ticks. 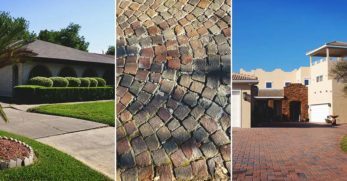 To get the best results from the insecticide, use the spray inside and outside your home on non-porous surfaces, and apply it every 3 months, to create an anti-roach and insect barrier that can protect your property up to 12 months. 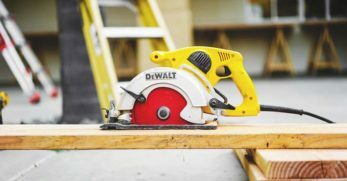 For indoor protection, apply a 4-inch barrier around window and door trims, baseboards and cabinets in your kitchen, as well in your bathroom, and garage for 3 months of protection. For outside protection, spray a 12-inch barrier around perimeters and foundations, doors and window trims, and around patio and deck perimeters, which will give you up to 3 months of full pest control. 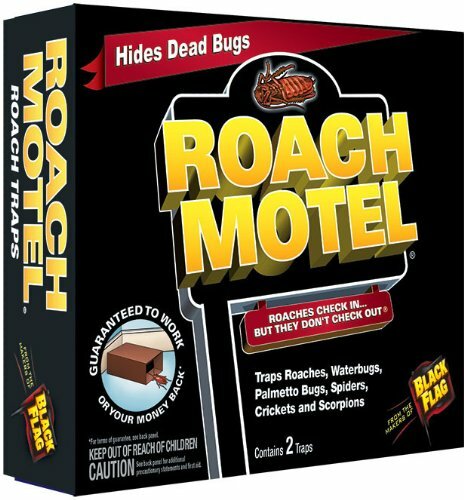 If you prefer a “no-mess and no-fuss” sanitary approach to roach extermination, the Roach Motel Insect Trap 12-pack from Black Flag is the perfect choice for controlling small roach infestations. The insect trap uses a very powerful attractant that roaches cannot resist and the result is a deadly stay in the Roach Motel, and even if they try to escape the trap, it is designed to injure them and trap them on the strong adhesive inside the trap. A brutal but very effective method of killing roaches. The baits do their killing in secret so you do not have to worry about unsightly insect corpses littering your living spaces. 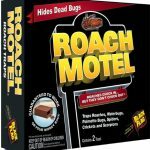 The Roach Motel baits are very easy to use, just place behind and underneath large appliances like fridges and freezers and kitchen cabinets, in the basement or garage, or any other dark places where roaches love to lurk around your home, and you will start to see the baits full of dead roaches within a few days. The traps are pet and children safe as the bait is contained securely inside the packaging. The roach motel can trap roaches and other insects like waterbugs, palmetto bugs, spiders and scorpion for up to four months. The baits are also available as a 1-pack and 2-pack. The Harris brand is synonymous with high-quality pest elimination and they have been manufacturing pest solutions since 1924. 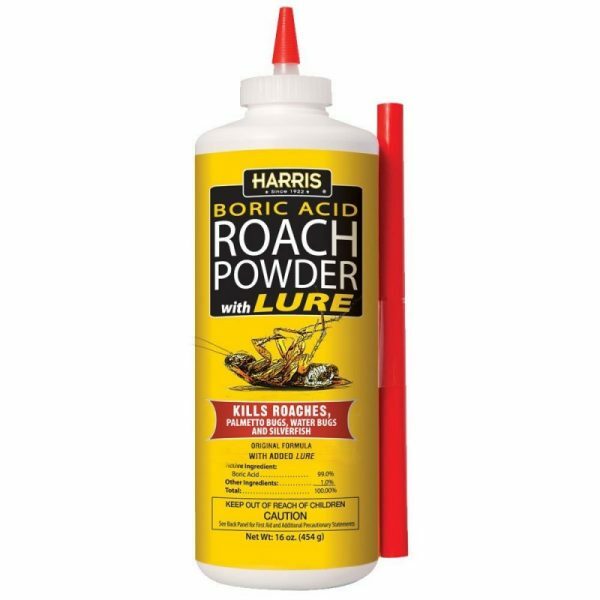 The Original and the Best, the 16oz Harris Boric Acid Powder contains 99% percent boric acid and one percent of Harris' special Food Grade Lure, so this powder is one of the most effective ways of killing roaches. 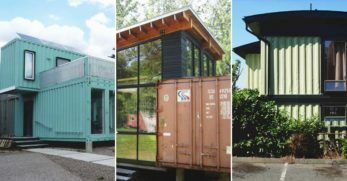 It can be used indoors and outdoors, for both domestic and non-domestic purposes. Besides being able to kill roaches and other crawling insects, even fire ants, the powder is registered with the EPA, so it is environmentally friendly, and it has a low odor and a low toxicity level for people and animals, but it is still a hazardous product if it is ingested or inhaled, so make sure that you apply it away from the reach of children and pets. The powder works by attracting the roaches and drying out their skins and you will start to see the results within just a few days. 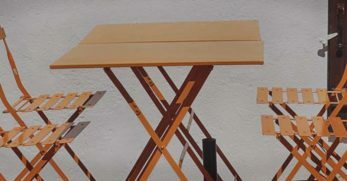 To get the best results, make sure that you follow the manufacturer's instructions on how to apply the acid powder: apply the boric acid powder liberally under and behind appliances and cabinets, the dishwasher, behind baseboards, or use the handy applicator to apply the product in those hard-to-reach places around your home. 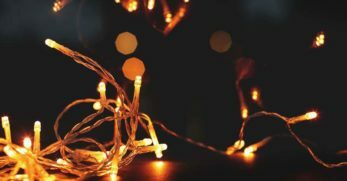 You can even use the powder outside, on the pavement outside your apartment, or in the cracks along the pathway around your house, or wherever you have seen roach activity. 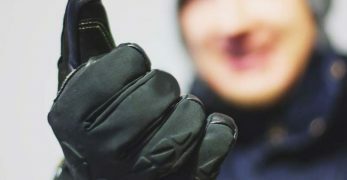 Just be careful when you apply the powder as it can fly everywhere, so it is best to use the applicator, and it is a good idea to wear a mask so that you do not inhale the fumes when you are working in a confined space. One way to effectively eliminate roaches is to target them where they love to hide. 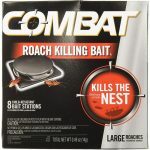 The Combat Roach Killing Bait Station allows you to kill nasty creepy crawlies 24/7 and each bait is effective for up to 3 months. To get the best results, place the baits behind the fridge, under the sink, behind appliances, and outside near the trash can. The large baits are specially designed to lure large roaches and it not only targets the roaches you see but also the ones that are lurking outside your property, just waiting to invade your living spaces. The Combat bait stations work by attracting the insects by releasing an irresistible smell, and once they enter the station and eat the powerful insecticide, Fipronil, they take the poison back to the nest, which then kills the entire population. 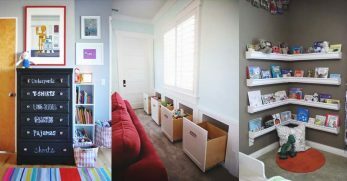 Although the bait station is child-proof, you need to place them where children (and pets) cannot reach them. The Combat pack contains 8 individual bait stations.